These 10 epic Avengers: Infinity War quotes prove that this is one of the most spectacular super hero movies of the year! Don’t believe me? Let’s check them out and I bet you’ll agree! Affiliate link: Free* Avengers: Infinity War Poster plus 10% discount on Marvel merch, w/ purchase or rental of select Marvel Studios titles on FandangoNOW! Well, the long-awaited moment is getting near. With Avengers: Infinity War, we begin the conclusion of Marvel’s phase 3, which will definitely be finished next year with the still unnamed Avengers movie previously titled Avengers: Infinity War – Part 2. For all of us who watched all movies building up to this one, expectations are high and the first impressions from the trailers definitely feed those expectations. After getting a glimpse of him in some of the previous films, like the Guardians of the Galaxy and especially his infamous smirk at the camera at the end of the Avengers, we should finally see Thanos in all his might in the Infinity War. Thanos: In time you will know what it’s like to lose. To feel so desperately that you’re right, that to fail all the same. Dread it. Run from it. Destiny still arrives. Thanos, played by Josh Brolin, is Marvel’s answer to ongoing critiques about the lack of powerful villains in their movies. Even though Thanos is already powerful enough as it was hinted from his previous short appearances, in Infinity War his power is supposed to go beyond imaginable when he collects all of the Infinity Stones in an attempt to obliterate half of the Universe in order to bring back the “balance”, which is basically the plot of the entire movie. Thanos: The end is near. When I’m done, half of humanity will still exist. Perfectly balanced, as all things should be. If you saw previous movies from the Marvel’s universe, you have seen how powerful some of the Infinity Stones are. Thor: [sees the Guardians for the first time] Who the hell are you? Of course, the Avengers will be in the center of attention, right after Thanos. The original group is here in its entirety, with Iron Man (Robert Downey Jr.), Captain America (Chris Evans), Thor (Chris Hemsworth), The Hulk (Mark Ruffalo), Black Widow (Scarlett Johansson) and Hawkeye (Jeremy Renner) representing the only hope for the salvation of the universe. Right next to the titular group of superheroes, to the aid come the Guardians of the Galaxy, including Peter Quill (Chris Pratt), Gamora (Zoe Saldana), Drax (Dave Bautista), Rocket (Bradley Cooper), Nebula (Karen Gillian), Mantis (Pom Klementieff), and of course, the lovely Groot (Vin Diesel). Peter Quill: Alright, Guardians, don’t forget this might be dangerous, so let’s put on our mean faces. The heroes from the latest and possibly the biggest Marvel’s hit, The Black Panther, will also join in the fight against the dreaded Thanos. We will see the Black Panther himself (Chadwick Boseman), Okoye (Danai Gurira), Shuri (Letitia Wright), Ramonda (Angela Bassett) and M’baku (Winston Duke), to name the most important ones. T’Challa: Evacuate the city. Engage all defenses and get this man a shield. In addition to all these characters, the cast is also made of other notable superheroes and villains, like Scarlet Witch (Elizabeth Olsen), White Wolf (Sebastian Stan), Dr. Stephen Strange (Benedict Cumberbatch), Spider-Man (Tom Holland), Heimdall (Idris Elba), Ant-Man (Paul Rudd), The Collector (Benicio Del Toro), Vision (Paul Bettany), Happy Hogan (Jon Favreau), Pepper Potts (Gwyneth Paltrow), Wong (Benedict Wong), War Machine (Don Cheadle), and, of course, the all-popular Loki (Tom Hiddleston). The movie is directed by Anthony and Joe Russo. Steve Rogers: Then we’ll do that together too. Is coming close to its end. Tony Stark: So this is it. It’s all been leading to this. And it is going to be truly epic. Get ready! 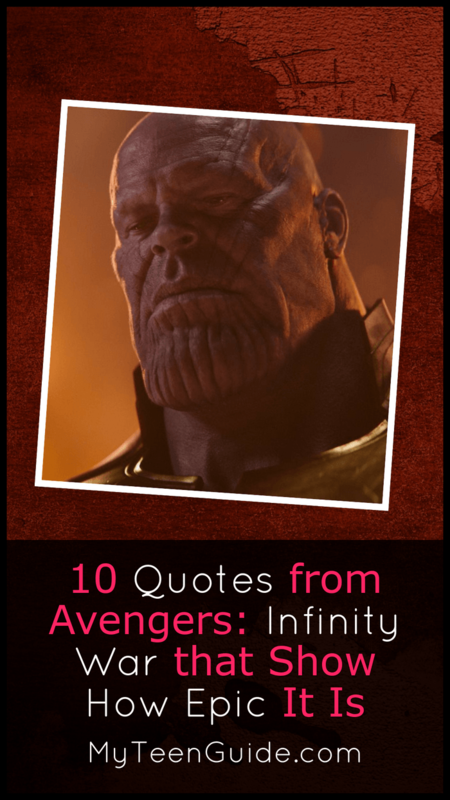 Have you heard any other epic Avengers: Infinity War quotes? Share below!